As someone who has spent my fair share of time in Canada, (mainly due to some of Mr. X’s acting gigs, but also because two of my colleges were in Rhode Island, so parts of that country up North were close enough to visit occasionally,) I can attest to the fact that Canadians, in general, are very nice people. But the ones portrayed in this true story are on another level altogether! Photo by Matthew Murphy, as is the one at the top of this page. 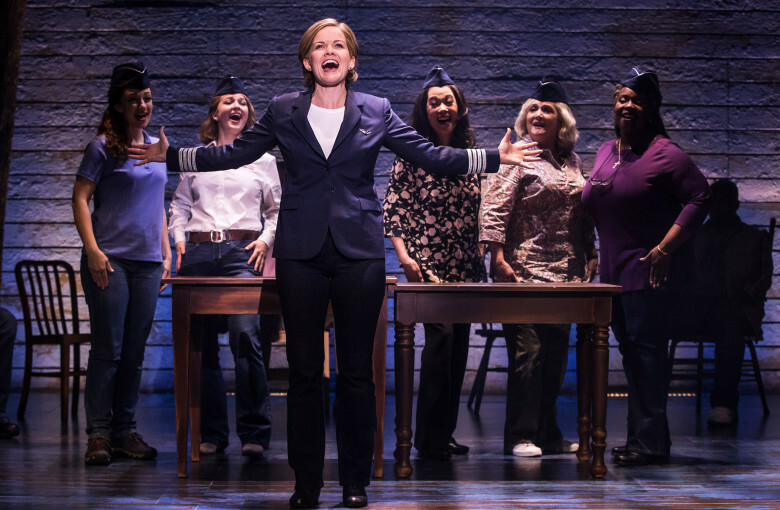 Come From Away is one of those Broadway musicals that I’ve been hearing raves about for a few years now. So, of course, with my track record, I was expecting to not agree at all. But this time I totally do. Not only is this show entertaining, but it’s so heartwarming that I’m still smiling a week on from the opening night of the First National Tour at the Ahmanson Theatre! And let me tell you, the hour and forty minutes (with no intermission) felt like only fifteen minutes! The time just flew by. When it looked like the tale was coming to an end, I was shocked; it’s the only time I looked at my watch the entire night because I could not believe it. Often shows with no intermission feel torturous, but this one went by in a flash. This story of real-life human kindness is so worthy of being told. 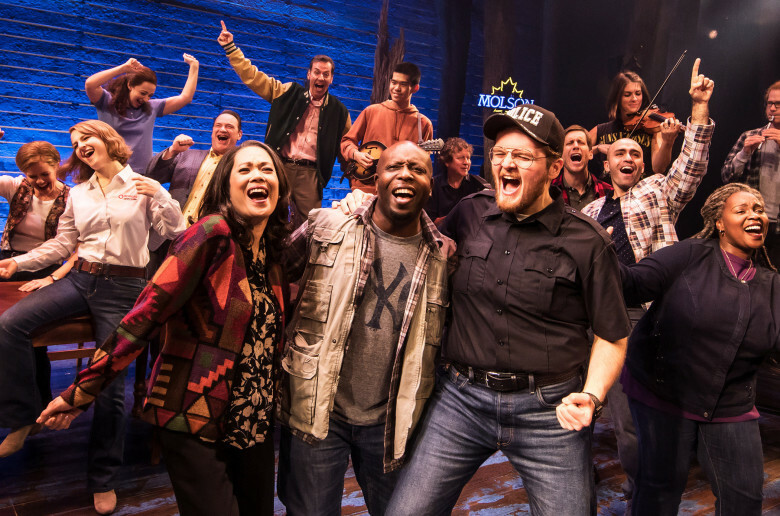 And Come From Away does it in the most creative and charming way possible. In case you don’t know what this musical is about, it’s the true story of how the tiny town of Gander, Newfoundland, Canada temporarily took in the almost seven thousand stranded plane passengers who were forced to land there on 9/11. The writers, Irene Sankoff and David Hein, cleverly gathered together several interesting personal stories from that experience, of both the passengers and townspeople, put it all to music, cast the most eclectic and diverse performers I’ve even seen in a Broadway tour, and here we are! As fascinating and amusing as the entire saga is, the staging is the most brilliant thing about this show. There are a dozen actors, equally divided between the sexes, who each play multiple characters seamlessly. Even with those multiple characters, some right after the other with just a change of a hat, it’s not the least bit confusing. And it’s all performed on what is essentially a bare-bones set comprised of some chairs, an occasional table or two, a backdrop that serves as the sky and the plane, and some trees on the sides, behind which are ten of the most talented musicians it’s ever been my privilege to hear. (Are you getting the idea that I love this show?!) The actors went in and out of those chairs as much as they did their different characters! And all that movement was great! I’ve known of this incredible human interest story for years now, but this brief theatrical presentation made it more clear to me than even all the television news features did! This story would be perfect enough as solely a play, but the music adds so much to the proceedings. When I read the program afterwards, I was shocked to see actual songs listed in it; I really thought that the music was going constantly, in a row, during the entire production. It felt like one long song, with some chatter filtered in. I honestly don’t remember the music ever stopping. And that’s all a good thing because the Irish-tinged music is all wonderful. And Kelly Devine’s musical staging makes it all flow. I rarely think of this integral part of a production, but this show has great direction! 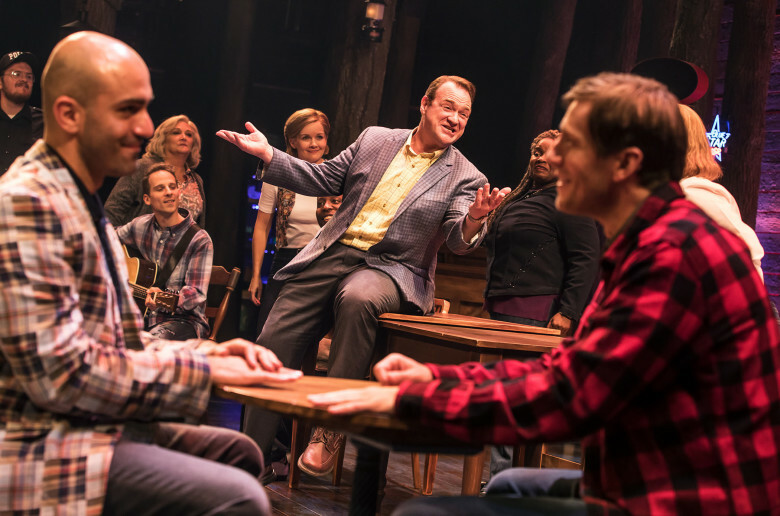 Christopher Ashley, who won a Tony for directing Come From Away on Broadway, also does the honors with this National Tour, with a whole new cast. 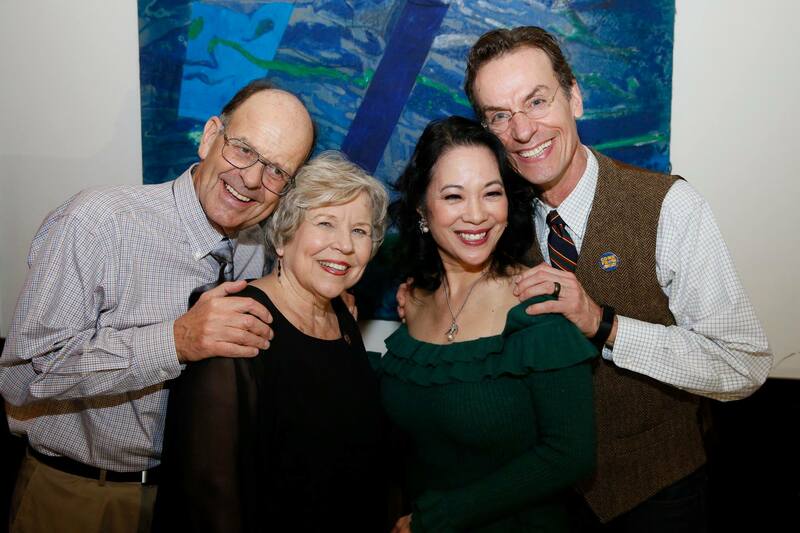 (L-R) The REAL Nick and Diane Marson, and the actors who play them–Christine Toy Johnson and Chamblee Ferguson. Photo by Ryan Miller. As to those actors, I love that not one of them looks like anyone you’d expect to see on a Broadway stage. My friend agreed and added that that’s what makes them all so very relatable–because they look like regular people, as opposed to stage performers. The opening night curtain call, with some of the real people this musical is about. Photo by Ryan Miller. Second best to seeing the real people during that curtain call is that each of the musicians got his or her own bow, which I’ve never seen before. And while doing so, they each played a little solo for us. It was all so lovely. On a personal note, I brought a pal who I felt could use an uplifting experience, and that’s exactly what we got. 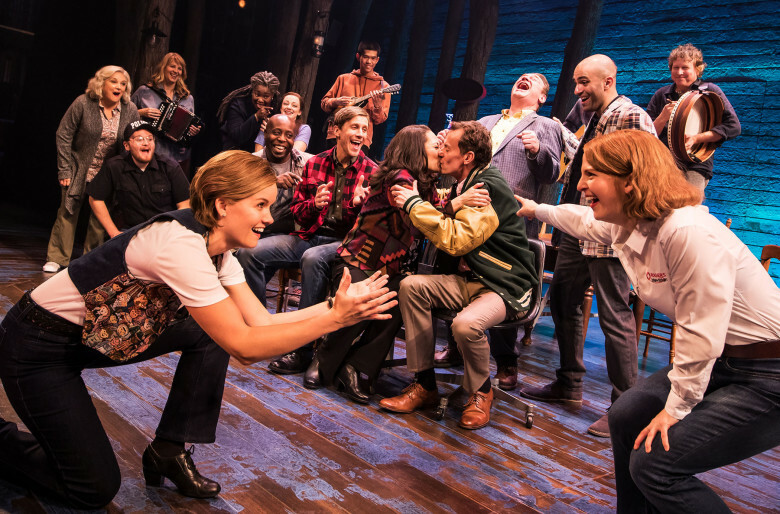 Come From Away is so much more than a stage production—it’s a reminder of how to be human beings, which I fear most of us need right now. I came away from seeing this show with not just a feeling of having been fabulously entertained but much more importantly, with a feeling of optimism and hope for our oh-too-troubled world. And, for all of us who’ve been thinking of moving to Canada in the past two years, I’ll race you to Gander!